The Gujarat High Court justified life term for the convicts in the Godhra train burning case, backing the conspiracy theory, but said they did not deserve death. 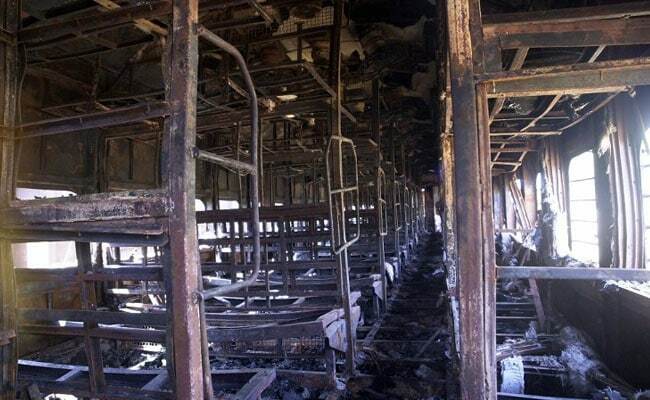 Ahmedabad: Cancelling the death sentence of 11 convicts in the 2002 Godhra train burning, the Gujarat High Court on Monday ruled that it was "neither terrorism nor an act of waging war against the state". The court justified life term for the convicts, backing the conspiracy theory, but said they did not deserve death. The number of deaths would have been far less, said the judges, had the coach not been overcrowded. Over 100 people could escape the burning coach, which, the court said, showed that the convicts "had the intention to cause death and maximum damage, they did not intend to enhance the number of casualties." Petitions had challenged the convictions and acquittals in the burning of the Sabarmati Express in Godhra, in which 59 people, mostly kar sevaks or Hindu volunteers returning from Ayodhya, were killed. The incident triggered riots across Gujarat, in which 1,000 were killed. With the court changing the death sentences, 31 people will serve life terms in the case. Judges Anant S Dave and GR Udhwani referred to the Law Commission's recommendation that the death penalty should be abolished for any crime that is not related to terror or war against the state. "The cases on hand have no genesis in the act of terrorism or waging war against the state," the court said. "Death penalties eliminate a person to a point of no return. While considering the question of sentence to death, a duty is cast upon the court to deliberate on various facets of sentence and to immunise itself to avoid branding imposition of death sentence as 'judge centric' or 'blood thirsty'," said the order made available on Tuesday. The Gujarat government was berated for "failing to maintain law and order" and to make better arrangements for devotees on the train. Also, the Railways Ministry did not take "measures to ensure the safety of the passengers or to provide alternatives", considering that the Sabarmati Express was "overcrowded", the court ruled. Confirming that there was a conspiracy, the judges said the "emergence, pattern, nature, ignition, colour of flames and temperature along with smoke and fire in coach S/6 of the ill-fated train based on replies by experts persuade us to reject theories canvassed by learned counsel for the defence about fire in the coach due to unknown causes other than the conspiracy for which the proper method of investigation in cases of arson was not followed."